Phil Collins: Not Dead Yet and performing in L.A.
Fast forward eight days. After a great week in Nashville I have spend to week working in San Francisco and have arrived at Los Angeles where I want to pick up my good friend Michel Reis from the airport. We know each other from school in Luxemburg. He has become an internationally successful jazz pianist and lives in Luxemburg and New York. Though we have played the odd jazz session we also share a passion for “classic” pop and rock music: Dire Straits, Genesis, Supertramp, Pink Floyd, Sting, Phil Collins, Roger Hodgson, to mention but a few. Though we had not met at the time, we both attended the same Phil Collins concert on the Both Sides tour in Metz in 1994 with our parents (we were eleven then); it was the “first big rock concert” for us both. And though so much time has passed since that first concert we still know what a burst of energy Phil was then, and how perfect his live shows were. It was not only the music, it was the ensemble of musicians in his band, always the cream of the crop. In the world of professional musicians people like Lee Sklar, Nathan East, Ricky Lawson, Chester Thompson and Daryl Stuermer are the reference. 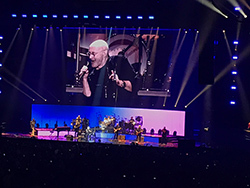 Quite apart from our musical preferences, for us musos, seeing Phil Collins live is a musical performance equivalent to the Champions League, if not the Champions League finals. We were afraid of being disappointed under the circumstances, which is one reason why we did not have tickets for Phil’s show at the Forum the next day (ticket prices were the other reason). 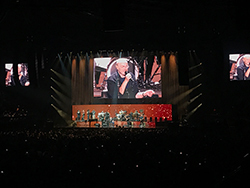 The concert was sold out, Collins’ performance on the North American leg of the tour had been very good to outstanding, the press reported from New York, Chicago, Milwaukee and Oakland. We decided to try our luck, go to the Forum and see whether we could get any leftover tickets. We ordered an Uber car to our flat in Brentwood and worked our way through the dense but moving traffic of Los Angeles. Three kilometres away from the Forum the traffic jammed. Ok, so this is L.A. Nobody takes the subway, everybody goes by car, and at this time everybody seemed to be on their way to see Phil. The show would start at 8pm, it was 7:25 and we were still in the car. We decided to get out and walk the last mile. Then I spotted the Forum. I knew its silhouette from photos, from the video game GTA V, from Genesis bootlegs from the 80s and basketball broadcasts on TV (after all, the Los Angeles Lakers have played here for several decades, and Michael Jordan won his first title against Magic Johnson). It was a Mecca of entertainment, and I approached the entrances reverently in the hope getting a ticket. It was a sobering sight: Instead of people who wanted to sell tickets I only saw people holding up signs that they were “looking for tickets”. The show must really be in demand, so off to be box office. We were lucky, for we got two ticket in the lower tribunes with a perfect view of the stage. In we went; it was 7:55. We were by no means the last to take our seats so there was still Motown music coming from the speakers and the slide show with many fine photos of Phil continued on the screens. The man in the row before me took out his cell phone, scrolled through his phonebook until he came to one “Daniel Fornero” and sent him a text message “Hi Danny, thanks for providing the seats.” People of all ages walked by wearing Phil Collins or Genesis T-shirts and carrying food and drink. African music, Salif Keita, began to play. The atmosphere changed. The music became louder, the people grew more excited. The sound was fine even then. The house lights go out, people cheer, a small man clad in black walks onto the stage with a walking stick. People go crazy. Their cheers are so loud it hurts in the ears. Phil takes his seat, says hi to Los Angeles, says what he says everytime and says that we will have a terrific evening and have lots of fun with each other. The first bars of Against All Odds ring out. The sound is clear and strong when his voice comes in. Perfect intonation, people are riveted when he moves into the chorus. All fears that he might not have what it takes anymore are unfounded; he still has it, and he has it as good as very few others out there. The drums come in and sends shivers down my spine. My buddy and I look at each other and nod: He is still great, we are in for a terrific evening. The second song is Another Day In Paradise; he sings it a bit too repetitive, but as opposed to other artists who keep trying to fight through their vocal escapades somehow Phil stays within the limits of his voice and has a clear intonation. Towards the end of the song he does the familiar sequences of call and repeat with Arnold McCuller. Phil varies them from the way he used to do them in 1990 and 2004, sticks to the lower register, but still offers interesting singing. This live version of Another Day In Paradise demonstrates how well-written it is, and the audience applaud wildly. I Missed Again is the first special moment that is immediately topped by an even stronger Hang In Long Enough. 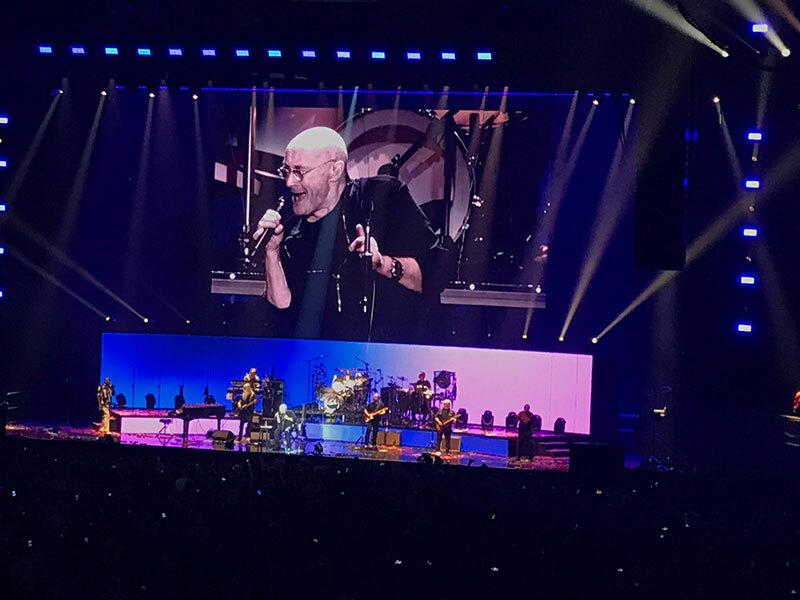 These two songs have what makes a Phil Collins show so special, even for seasoned concertgoers like my buddy Michel and myself: the Vine Street Horns. This ensemble produces a sound so precise and powerful like no other in the pop and rock business. The sound in the venue is so clear that it is pure joy to listen to this perfectly attuned band. As a drummer I watched and listened to the drummer and percussionist, of course. What can I say: This is young Phil Collins on the drums. The punch Nic Collins delivers on the drums has rejuvenated the band. Outstanding. After frenetic applause and terrific vocals by Phil a brief speech ensues. Phil mentions something about a band, something about “three or four hundred years ago” and “very good friends”. Genesis music follows and the crowd go crazy. I wondered how it could be that Phil’s audiences are at least twice as loud as those of Sting or Mark Knopfler; well, of course his music is much livelier than the latter’s. Phil added that they had recorded several albums with Genesis, and that though he was aware that it was highly unlikely that he had chosen the song people wanted to hear they would play this song regardless because it was his own damn band and they would play what he wanted them to.”. Phil obviously has not lost his sense of humour; he appears in high spirits and enjoys the music. Daryl plays the first chords of Throwing It All Away. The audience applauds appreciatively, a few “aahhhhhh”s and “aaawwwwww”s can be heard in the crowd. I am happy, too, for I love the song and its performance and the fine sound. Nicolas plays the beat with the same feeling as his dad who sticks close to the studio version. The song is played a third lower these days, but does not derogate that at all. During the last bars the band stops, the camera zooms in on Phil, he repeats a few times: “I don’t … no no I don’t … I don’t wanna …” organ comes in … Phil shrugs without turning around … gives the sign for the final chord … “gooooooo” … shivers down my spine. It is most impressive how alert, how musical, how professional this jack-of-all-trades is..
“There is a handful of criteria that make out a great singer. One of them is if he sings as well live as on record, and Phil Collins meets that standard. 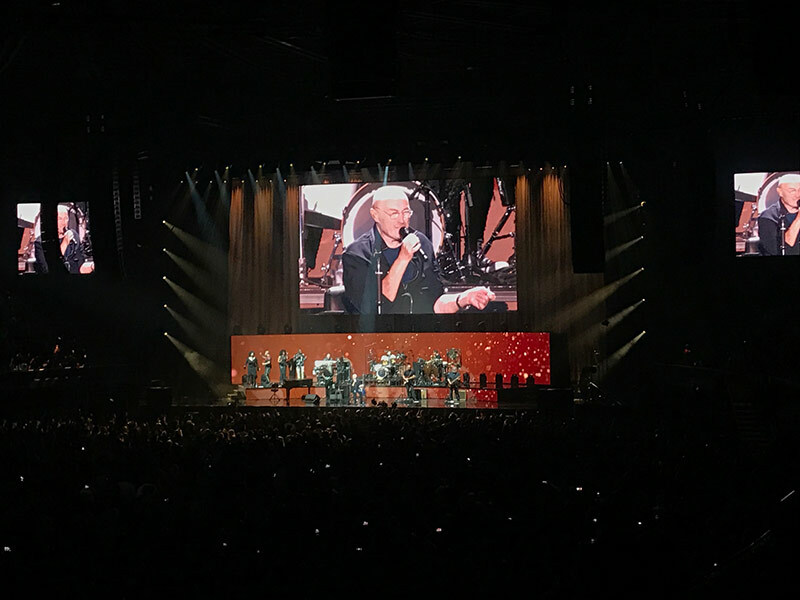 There was a clear difference to the concert of Rod Stewart a few days ago who did not quite hit the notes anymore.” Though a number of videos on Youtube I saw in June 2017 left me in two minds as to whether Phil still had it, this fantastic show with a number of very strong performances of You’ll Be In My Heart, In The Air Tonight, Sussudio and Easy Lover returned my full trust in Phil – he had still got what it takes. He sang very well this night, his band and the whole show were outstanding. Two hours of a band that enjoyed playing and singing, worldwide hits, a number of hidden gems (You Know What I Mean, Can’t Turn Back The Years) and a drum trio where Phil proved by trading 4 soli on a kind of big woodblock with Richie that he still has that incomparable Collins feeling, perfect timing and feeling for the rhythm. No, this man is not dead yet, he still belongs to the Champions’ League of world-wide pop/rock musicians, even though I really missed his drumming. On the way home the concertgoers rave about the show and sing his songs out loud. The last time I have experienced such a wave of great enthusiasm was at the Roger Hodgson show in Berlin two months before, though Phil’s band performs at least one league above the Hodgson band. To be sure, Phil sits and he does not drum, and you cannot compare this to 1997, but his songwriting, his voice, his presence on stage and his outstanding band justify his status, and I have yet to find a journalist who claims the opposite. Within two weeks I got to experience Chester and Phil (albeit each on their own). The only one missing was Nir Zidkyahu, but he was on tour, or else I might have met him in Nashville, too. This was a trip to the United States that really paid off Genesis-wise!